If you run a company – whatever its size – employees will inevitably take time off due to illness. Yet despite it being a fact of life, the thought of unplanned absences weighs heavily on bosses` minds. Across the world, sick leave is a huge drain on productivity. The average UK employee takes 9.1 days off each year, costing employers £29 billion, PwC research has shown. And although figures are lower in other regions, workers in the US and Asia still notch up 4.9 and 2.2 sick days on average respectively. One inevitable result of a team member being ill is that other employees need to pick up their workload. The earlier people know that someone isn’t going to be in, the quicker outstanding tasks can be distributed and dealt with in their absence. The absolute foundation of smart sick leave management is putting procedures in place that your workforce must follow registering as unwell – either over the phone or via email – and employees should know whether to contact their line manager or HR as a first port of call. This protocol shouldn’t stop at the person who’s off either; there needs to be a clear chain of command when it comes to which personnel need notifying when somebody is absent. This prevents information being drip fed, and key colleagues being left out of the loop. Software like WhosOff can notify relevant managers when someone is off due to illness. This ensures that personnel are updated straight away, and plans can quickly be adapted so that standards aren’t compromised despite unexpected staff shortages. Good companies want to support their workforce during times of bad health and help them return to work as quickly as possible. In order to achieve this, you need to understand the exact reasons that someone is off sick – particularly if it’s a recurring issue. Keeping all employee records in a central location can make this process much easier. You may require staff to produce a doctor’s note if they are off for more than 48 hours, for example, and these can be recorded on their personal record for future reference. Equally, if you are concerned that a team member is taking too much time off work, you can record details of any consultations you have with them. Improving the way in which you manage sickness-related paperwork can have a positive impact not just on managerial and HR workload, but associated departments too. For instance, if a member of staff exceeds their annual sick leave entitlement, leave management software can be used to help HR departments so that payroll can be amended accordingly. This avoids costly and potentially embarrassing miscalculations, at the same time as cutting down admin. As we’ve already mentioned, staff sickness is an inevitable part of running a business, and most of the time it can’t be helped. However, there are situations in which employees take advantage of sick leave policies, and the cost of this to company productivity is huge.Monitoring employee absences through a leave management platform will enable your organisation to analyse the number of days that team members call in sick over a period of time and identify any concerning trends. At the very least you may want to offer HR support, to understand exactly why certain colleagues are struggling with their attendance. Leave management software can formalise this process by triggering response procedures when an employee hits a certain number of days off sick. With the appropriate procedures in place, you can get to the root of the problem and reduce the number of unnecessary absences taken across your organisation. WhosOff has already helped businesses in 65 countries worldwide manage staff leave more effectively. Our online software has logged more than 23 million sick records, and with our analysis companies have cut avoidable staff absences by up to a quarter. 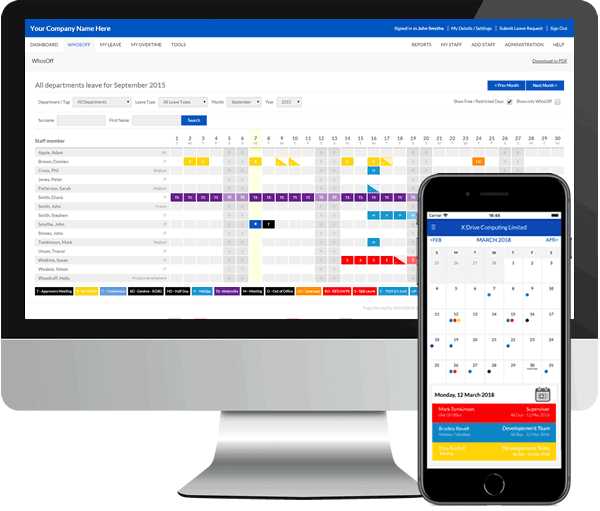 Try WhosOff for free to see for yourself how the right technology can enable smarter sick leave management – and prevent absences from causing chaos.